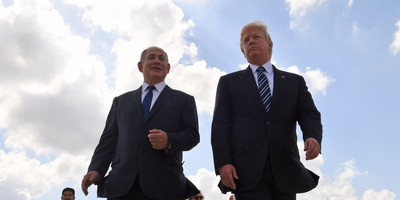 Handout via GPO/Getty ImagesPresident Donald Trump with Israeli Prime Minister Benjamin Netanyahu in Jerusalem in May. President Donald Trump told the Palestinian Authority’s president that he would move the US Embassy in Israel to Jerusalem, and he is expected to recognise the city as the capital of Israel on Wednesday. Doing so would be in line with Israeli law but would violate international law and would most likely upset Arabs and Muslims across the region. The move could seriously undermine Israeli-Palestinian peace efforts. It could also strain US regional relationships, potentially putting its strategic interests at risk. President Donald Trump plans to move the US Embassy in Israel to Jerusalem, and he is expected to announce on Wednesday that the US will recognise the city as the capital of Israel, multiple news outlets have quoted senior administration officials as saying. Trump informed the Palestinian Authority’s president, Mahmoud Abbas, and Jordan’s King Abdullah II of his decision on Tuesday. He is set to deliver a major speech from the White House at 1 p.m. ET on Wednesday. Leaders and diplomats across the Middle East have predicted that such a move might scuttle peace negotiations, embolden extremists, and even spark a new conflict in the region. Abbas has said relocating the embassy would bring “dangerous consequences,” and one of his aides said recognising Jerusalem as Israel’s capital would lead the Palestinian Authority to cut off ties with the US, Haaretz reported Tuesday. “President Abbas warned of the dangerous consequences such a decision would have to the peace process and to the peace, security, and stability of the region and of the world,” Nabil Abu Rudeina, a representative for Abbas, said. Another senior Palestinian official, Nabil Shaath, made grim predictions about the future of the Israeli-Palestinian negotiations if Trump were to make good on his promise. “The mother of all the deals dies here on the rocks in Jerusalem if he says tomorrow that he recognises a united Jerusalem as the capital of Israel,” Shaath said. “He is declaring war in the Middle East, he is declaring war against 1.5 billion Muslims (and) hundreds of millions of Christians that are not going to accept the holy shrines to be totally under the hegemony of Israel,” Manuel Hassassian told the BBC. Recognition of Jerusalem, coupled with the embassy move, would be consistent with the stated wishes of Israeli Prime Minister Benjamin Netanyahu but would make the US the only country with an embassy in the contested holy city. Moving the embassy would elicit strong feelings among Muslims and Arabs, many of whom see it as an unwelcome intrusion into matters they feel must be decided through negotiations and not unilaterally by the US. Ayman Safadi, Jordan’s foreign minister, said an American recognition would “trigger anger across the Arab and Muslim world, fuel tension, and jeopardize peace efforts.” He was joined by Egypt’s Foreign Ministry, which gave Trump a similar warning, along with the US allies Turkey, Saudi Arabia, and France. On Monday, Turkey’s deputy prime minister, Bekir Bozdag, made a grim prediction regarding the move, saying it would “be a major catastrophe” for the region. Arab League Secretary-General Ahmed Aboul Gheit expressed a similar sentiment Saturday, saying it could lead to sectarian conflict. “Today we say very clearly that taking such action is not justified … It will not serve peace or stability but will fuel extremism and resort to violence,” Gheit said. The move would almost certainly have detrimental effects on the Israeli-Palestinian peace process, which Trump’s son-in-law and senior adviser, Jared Kushner, has been tasked with heading up. The Palestinians seek East Jerusalem as the capital of a future Palestinian state, and the United Nations maintains that Israel’s continued occupation of East Jerusalem, which it conquered in the Six Day War in 1967, is illegal under international law. While several countries previously had embassies in Jerusalem, they have now all either moved to Tel Aviv or cut off relations entirely after Israel added a law calling the holy city the “complete and united capital of Israel,” according to Haaretz. Shira Efron, a policy researcher and special adviser on Israel at the RAND Corporation, told Business Insider that even though there are ways the US could legally recognise Jerusalem as the capital, any move would be incredibly risky. Palestinian Arabs have indicated that they would not sit idly by if Trump named Jerusalem the capital of Israel. Hamas, the Gaza-based Palestinian group deemed a terrorist organisation by the US, has threatened a new intifada, or “tremor,” following uprisings against Israeli forces in the late 1980s and in the early 2000s that resulted in thousands of deaths on both sides. “It’s worth reminding that in the year 2000 a visit by then opposition leader Ariel Sharon to Temple Mount sparked the second intifada that lasted through 2005 and led to death of about 3,000 Palestinians and 1,000 Israelis,” Efron said. “Most recently, the 2015 ‘stabbing intifada’ was prompted in good part by suspicions that Jews were attempting to change the status quo in the Temple Mount. 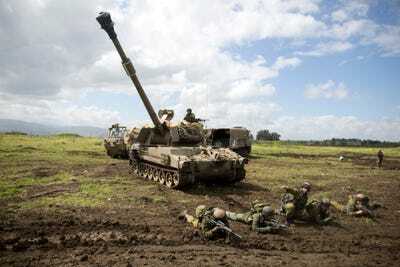 Lior Mizrahi/Stringer via Getty ImagesIsrael Defence Forces training in the Golan Heights near the border with Syria in March 2016. Israel has maintained a heavy security presence in the Heights throughout the course of the Syrian Civil War. A reversal on policy in Jerusalem would not only affect Israel and Palestine, Efron warned, but would also be likely to affect nearby Arab and Muslim countries. The US is involved in a numerous regional engagements in the Middle East involving countries that are openly hostile to Israel, including Iran and Syria. Other regional actors who work closely with the US would also most likely be affected. The State Department has reportedly warned American embassies worldwide to heighten security ahead of Trump’s expected announcement. Even if strategic rivalries that are mediated by the US do not unravel, the Israel Policy Forum’s policy director, Michael Koplow, wrote, the risk of violence stemming from any symbolic American moves is very real. “There is no question that it will result in chaos and riots somewhere,” Koplow wrote on his personal blog. “Is making a completely symbolic statement of moving the embassy worth even one American, Israeli, or Palestinian life?